Patients missing any number of teeth can receive the benefits of dental implant supported tooth replacement at Rogersville Family Dentistry. Dental implants are titanium posts implanted below the gum line that fuse with gums and supportive alveolar bone tissue to provide natural, comfortable support for any number of replacement teeth. Whether you’re missing one tooth or a full arch of teeth, dental implant supported tooth replacement may offer the most natural looking and feeling results. Contact our team to schedule your consultation today. 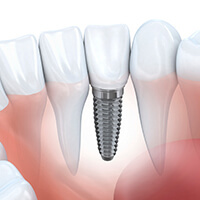 The dental implant tooth replacement process is completed over two phases. The first is the surgical placement of implant posts to replace lost root structure. The second is the attachment of a replacement tooth or teeth. While many dentists only offer the second phase of treatment in their practice, Dr. Timothy D. Gunnin is happy to perform every stage of the implant process in one convenient location. Patients who decide to pursue dental implant-retained tooth replacement should plan to visit our team several times over the course of three to six months. While this timeline can be off putting, we encourage patients to remember the results often last a lifetime compared with other tooth replacement solutions that need to be repaired or replaced in five to ten years. During the initial treatment appointment, we’ll remove any damaged teeth as necessary and place an implant post or several posts below the gum line. Once the implant post is in place, we attach a protective cap that allows the implant to fuse with the supportive tissue over the course of three to six months. Once the implant is bonded to the gum and jawbone, patients return to our office where we can attach a single dental crown, fixed bridge, denture, or partial.